This review of Appleseed Lane is part of the Second Annual Natural Parents Network Holiday Gift Guide hosted by Natural Parents Network! Mikko's psyched. Alrik's skeptical. He came around. This is a joint review and giveaway of an Appleseed Lane science & craft box plus $10 gift certificate between Natural Parents Network and Hobo Mama. and you can spring for the sibling add-on for extras. Appleseed Lane will spark a lifelong love of learning with monthly boxes full of science experiments and lesson-based crafts. Geared toward ages 4-10, these boxes are perfect for homeschoolers and natural learners. Boxes can be purchased a la carte or at a discount with a 6-month or 1-year subscription, and there's an optional sibling add-on for extra supplies so no one has to squabble over the fun! Each box has a surprise theme (such as Halloween — our review box, Mystery — November, and Electricity — December) and an educational children's book full of fun facts and colorful illustrations, and all the supplies for the experiments and crafts are included, with easy-to-follow illustrated instructions. Have family fun learning and playing with an Appleseed Lane box surprise every month! Six-year-old Mikko could handle all the steps himself. By the time we finished the other projects, the soap was ready to pop out! When I heard about Appleseed Lane, I knew it was the perfect fit for our unschooling family! Particularly since my six-year-old can't get enough of science experiments. I was really impressed with the quality of the Appleseed Lane Halloween box we reviewed. The design was crisp and high-class, featuring full-color photos of cute kiddos making the projects as well as step-by-step illustrated instructions. I loved loved loved that ALL the supplies were included. There was no running around trying to find tape or string or a marker or whatever. The only things we had to grab were readily accessible items like, you know, water, or scissors. Plus, since everything was portioned out into little zip bags, it was super easy to follow the recipes and directions. …with a glow stick in the center! Another cute feature was the included badge chart. Each box comes with a sticker of honor that can be placed on the chart after completion. As a one-time Girl Scout, I approve. I really appreciated the optional sibling add-on for double the supplies. Even though the box isn't geared toward two-year-olds, I knew there was no way to stop Alrik from playing along. Fortunately, with help, he still had a great time. And with the sibling add-on, we had enough supplies for both kiddos, so no squabbling! Mikko was good at measuring. Can you tell someone enjoyed the Sharpie and food coloring a bit too much? Making a Monster Slime monster! After we did all the projects (and the boys made us march through them all in one long session – they were having a blast! ), we read the science-minded storybook that came along with the box. Mikko and I both enjoyed it. I was happy it explained all the science we'd just experimented with in a child-friendly manner and did it in such an engaging way. Mikko settles in while Alrik grabs a post-project snack. The only small problems we had with the box were minor. The first craft — making a Frankenstein's monster container for the slime – was too involved for my boys. Mikko could have done it himself, but he's too much of a perfectionist to tape, cut, and trace if it's not absolutely precise. It was definitely too involved for Alrik, so we just set him loose with scrap paper while Sam and I worked on the craft for the boys. In general, it was a lot more effort than I'd usually bother with for a craft, heh heh. I had to cut out monster features, trace them on a foam sticker sheet, then cut out the foam, and then Mikko stuck on the stickers. I'd be just as happy if we skipped straight to some stickers, even if they're not as cute. But, you know … I'm lazy. I have to admit, though, the finished product was adorable. Mikko tried out the tracing but got discouraged quickly. We had to give Alrik something to do. Fortunately we had an extra face to maul. He decided this was also acceptable. …we all thought it looked hilariously like brains. It was even funnier after it had settled. We popped the overflow into a baggie — done, and done. The experiments went off without a hitch. The kids were so entranced by the whole kit that I honestly went then and there to the website and ordered a six-month subscription, with sibling add-on. We're really looking forward to our November box that's supposed to be perfect for junior detectives — woohoo; Mikko's a huge mystery fan — and the December box that will be all about electricity — another intense interest of Mikko's, and one I've felt at a loss for how to safely explore. So we can't wait! Blowing bubbles in the slime: A Mikko activity not suggested by the creators. This box is endless fun. If you buy a subscription or gift certificate of $25 or more by December 6, Appleseed Lane will donate a box to the Arlington-Alexandria Coalition for the Homeless on your behalf. Homeless children represent 60% of AACH's clients. So mark off a gift on your holiday list, and give a gift to a homeless child this season! You can purchase your own monthly boxes at AppleseedLane.com, starting at $23. The company offers one-time boxes ($23), 6-month ($21/month) and 12-month ($19/month) subscriptions, gift subscriptions, and gift certificates in any amount. The sibling add-on (one per box) starts at $9.95/month and goes down to $7.95/month with a 12-month subscription. Free shipping is included in all subscriptions! 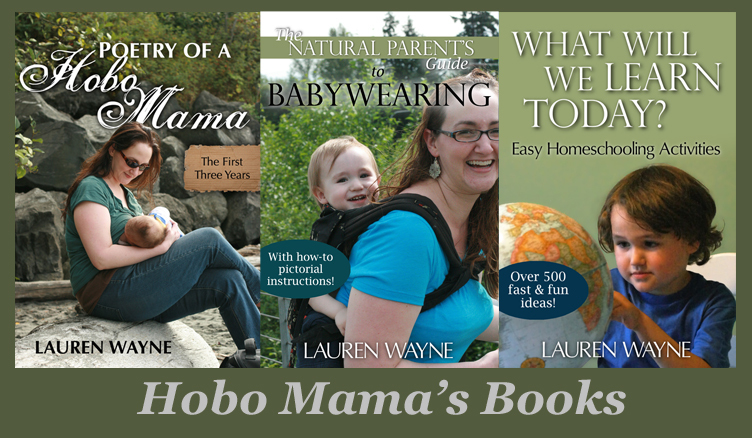 Plus, just for Hobo Mama & NPN readers, here's a special discount! Get $5 off for "Join" or "Gift" Subscriptions with the coupon code 5OFF. For your own chance to win one science & craft box plus a $10 gift certificate from Appleseed Lane, enter in the Rafflecopter widget below! Or you can visit the full NPN Holiday Gift Guide to see and enter to win all of our fantastic prize packages at once!